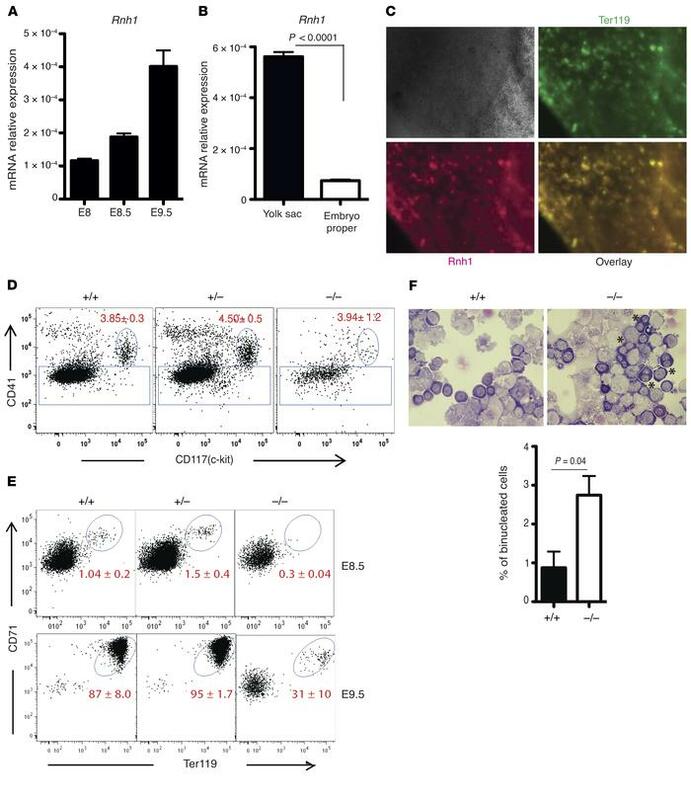 Rnh1 is expressed in embryonic erythropoiesis and regulates erythroid differentiation. (A and B) qRT-PCR analysis for Rnh1 on whole embryos from different embryonic days as shown (A) and E9.5 yolk sacs and embryos proper (B). mRNA levels are normalized to 18S rRNA expression (n = 3–4). Data are shown as mean ± SEM. (C) Immunostaining of a WT E10.5 yolk sac with RNH1 and the erythroid marker TER119. Original magnification ×20. (D) Flow cytometry analysis for HSPCs on E9.5 yolk sac cells (n = 3–4). (E) Flow cytometry analysis for CD31-negative erythroid cells on E8.5 and E9.5 yolk sac cells (n = 3–4). Data are shown as mean ± SEM. (F) Cytospins from yolk sac cells were stained with Pappenheim stain (left). Binucleated erythroblasts are indicated by asterisks. Representative bar graph showing percentage of binucleated cells (right) (n = 3). Original magnification ×400. Data are shown as mean ± SEM. P values were determined by 2-tailed t test.